If you’re looking for Bluetooth earphones that are perfect for a workout, or if you just want a pair of wireless headphones that sound terrific, have good battery life, and won’t cost you an arm and a leg, you’ve come to the right place. 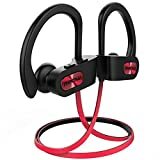 The Mpow Flame Bluetooth Headphones have an IPX7 rating so you never have to worry about getting them wet while you work out or while you jog in the rain. They also look great, sound great, and offer up to 9 hours of playback per charge. They’re a true bargain at their full price of $30, but you’ll only pay $19.99 if you snag a pair today.